Khanna has advised the U.S. National Intelligence Council’s Global Trends 2030 program, and says the lines that connect us are already becoming battlefields because they are so lucrative. On the other hand, he suggests that “connectivity” may prevent more wars than start them. According to Khanna, our newest form of infrastructure – communications – represents a huge shift in how people today should think about borders, allies and rivals. What’s different is that large amounts of infrastructure are built across borders now. Traditionally we have thought of the world as organized primarily into divisions between states. Khanna pointed out that the world is expected to spend two to four times as much on infrastructure each year as it does on all the military budgets in the world combined. Connectivity shapes the relationships between states and borders by changing the way states relate to each other and “augments political geography with functional geography,” said Khanna. Basically what it means is that through connectivity, countries that would otherwise not be friendly may be less likely to declare wars because they have other interests such as bandwidth and trade routes they value in maintaining the health of their networks. Clearly, connectivity is shaping relationships between states now. Director of the National Geospatial Intelligence Agency (NGA) Robert Cardillo used the iconic 75-year-old Mount Rushmore National Memorial (dedicated in South Dakota) as a vehicle for bringing forth a framework for elements necessary in the intelligence work of the country: value, partners, profession and people. The first being George Washington, a surveyor, mapmaker and spymaster. Washington recognized the need for value. 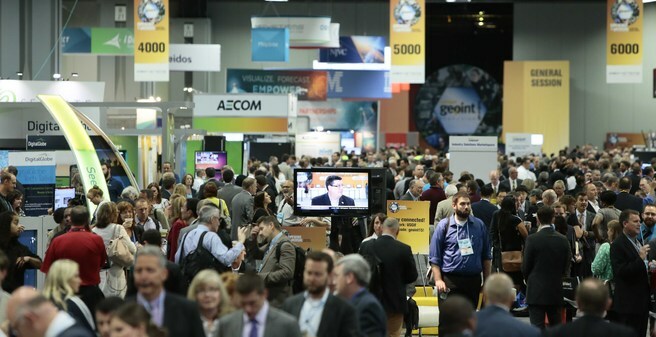 GEOINT Services replaces the transactional and outdated mindset. “We will be all in the cloud by 2017,” said Cardillo. He also encouraged the “gamifying” of platforms, to encourage customer relationships by integrating innovative customer service interfaces, offering trial accounts and API keys. At the forefront of discussions throughout the Symposium was the topic of where commercial technologies fit into the whole geo-intelligence arena. Granted, the government cannot produce all the technologies that the commercial sector can produce, nor do they have the flexibility to create that those vendors have or the ability to produce them in a timely fashion. For Thomas Jefferson, mapping was an intelligence activity. He commissioned the Lewis and Clark expedition and created the country’s first cipher system to transmit coded information in advance of the Louisiana Purchase. The NGA is reaching out with technology development and developing new professional certification and standards to create community. “It is critical that we transition to an object based intelligence environment, OBP imports important information from the frame of an image to produce more useful intelligence,” said Cardillo. CIBORG was created to purchase GEOINT commercial data and will be operational by early 2017 to help with big data analysis. Cardillo said the NGA has doubled their In-Q-Tel investment to upwards of $10 million, and worked with USGIF to integrate their GEOINT Solutions Marketplace (GSM). Abraham Lincoln, surveyor, was all about people. Today the NGA is in competition for the brightest minds and best skills. Risk-taking is exactly where creative juices come from, according to Marcel Lettre, undersecretary of defense for intelligence. The NGA collaborates with new partners across the government sector and academia. It has established its GEOINT Professional Certification Program for the Defense Intelligence Enterprise, awarding over 6,000 certifications since 2013. NGA and USGIF share reciprocity with the USGIS Universal GEOINT Certification Program, making the NGA and USGIF certifications equivalent. Dr. Peter Highnam, director of research at the National Geospatial-Intelligence Agency (NGA) is part of the reorganization of the NGA Research. The result of a reorganization initiated early this year by NGA Director Robert Cardillo, NGA Research replaces the agency’s former InnoVision Directorate and will diverge from its predecessor in at least one major respect: Rather than focusing inward, NGA Research will focus outward, concentrating on the activation of external research in seven distinct focus areas: radar, automation, geophysics, spectral, environment and culture, geospatial cyber, and geophysics. Along with three special projects shared by Highnam—the In-Q-Tel Interface Center; the GEOINT Pathfinder 2 project; and the creation this summer of a permanent NGA office in Silicon Valley, to be known as NGA Outpost Valley—NGA Research will work toward delivering technological capabilities to warfighters, policymakers, and first responders. In keeping with the keynoters’ interest in what the commercial sector can offer the government, a panel discussion on Tuesday entitled, “How Does the Remote Sensing Revolution Enable GEOINT?” answered many questions and posed many more questions on the topic. Panelist Walter Scott, DigitalGlobe’s founder and CTO, said they must discard ¾ of the imagery collected in the short wave infrared (SWIR) spectral band because the government restrictions don’t allow its sale to commercial customers. This type of restrictions harkens back to the day when regulating commercial capabilities were the sole province of governments. Deputy assistant secretary of defense for space policy said that commercial space industry regulations were designed to minimize national security risks rather than reaping the benefits of the technology. Robbie Schingler, co-founder and chief strategy officer of Planet Labs, creator of small sats,said “The commercial remote sensing market is a $1.6 billion market with the U.S. driving it. Europe and Asia are behind that. The government needs access to innovation; Silicon Valley is one example of that. It’s not just about risk around that, once you identify new ways of solving problems, you still have stuff that continues to work. The government doesn’t have a corrective mechanism for disruptive technologies. Where government falls down is when it is trying to assess corporate risk when they go to assess services. Business models are so different. Over past decades one conversation was, is the commercial remote sensing industry overly dependent on government? Today commercial remote sensing non-government revenue is substantial. Yes, the government is still the largest customer of DigitalGlobe, but the rest of their business is very viable and continuing to grow. The U.S. government decided there could be an emergence of the commercial geospatial industry. With new sensors, decreased barrier of entry into space, we’re on the next chapter, not fully commercial yet, we don’t have derived information feeds. The U.S. government is the most strategic customer for a U.S. company because they are regulated by the U.S. government. Well crafted policy encourages investment and shapes the strategic environment as well. The Exhibit Hall clearly reflected a panoply of commercial technologies designed to be very useful for governments. The efforts to mine Silicon Valley will undoubtedly reap some more valuable discoveries in technologies that can fit the criteria. Yet for some of the vendors, the tables have turned. As one exhibitor said, “What remains to be seen is whether the products we develop for the government which are a smaller niche, will provide as much ROI for us as those we develop for our commercial sector.” Also a factor is the ubiquity of cell phones among warfighters. A free app apparently can easily be downloaded and used without needing to be requisitioned for and can provide immediate access to maps, photos and other critical information. With all that said, government approval of technologies still holds a certain undeniable cache. Providing specific products for the government can become an indirect value-add in selling to commercial customers — even if they don’t use those particular products themselves. This entry was posted on Wednesday, May 18th, 2016 at 6:56 pm. You can follow any responses to this entry through the RSS 2.0 feed. You can leave a response, or trackback from your own site.